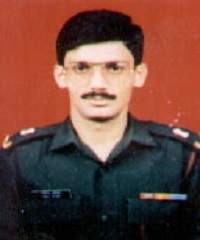 Major Manoj Talwar was born on 29 August 1969, in the town of Meerut in Uttar Pradesh. He was the son of Captain P.N Talwar (retd.) and Usha Talwar. The family had to move away from Meerut when he was ten years old, as his father was posted to Kanpur. They were residing in the military colony in Kanpur. Living in close quarters with other army personnel like his father, got him drawn towards the army. He adored and yearned for the army lifestyle. After school, he would daily go to the nearby ground where the armymen used to practice their drills and would sit at a distance and watch them. He would wear his father’s uniform after he returned home and would show it to all his friends and enact like a captain. He would always say that he would join the army after growing up, recalled his parents. A third generation officer, Maj Manoj Talwar, left the more lucrative option of becoming an army doctor when he chose to join the National Defense Academy. After joining the army, his mother planned to get him married and asked him about his opinion but Major Talwar told her that he has committed himself to the country and country’s goodwill and would be ready to give his life whenever the country requires it, and so he cannot commit to another person. This made his mother very proud of him. Maj Talwar was leading a patrol in the world`s highest and most ardous battlefield. When the opposition army attacked, he stood up bravely against them along with his troops and fought. In the battle, he was shot in the head and he collapsed immediately. He made the ultimate sacrifice of life in the service of the nation.